With class, style and hard hitting performance the KWA M1911A1 is truly a shooters gun. Made by one of the top airsoft manufactures in the world this gas blow back is a fine example of how a gas gun is supposed to be made. 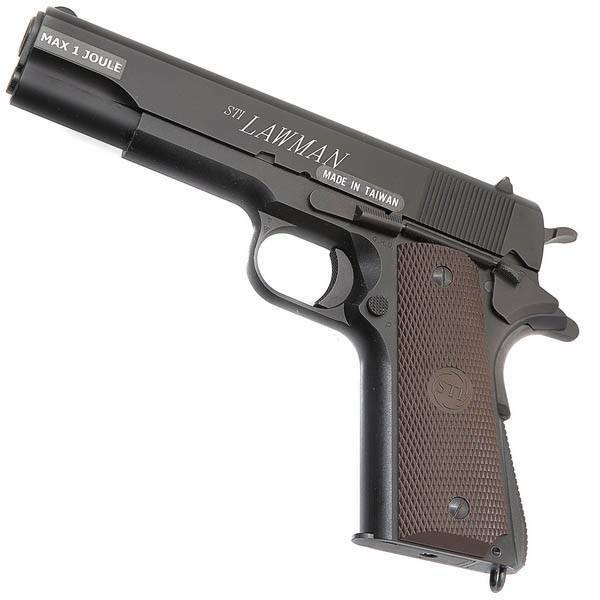 The STI Lawman by ASG is one of the most authentic 1911-style gas blowback pistols on the market. 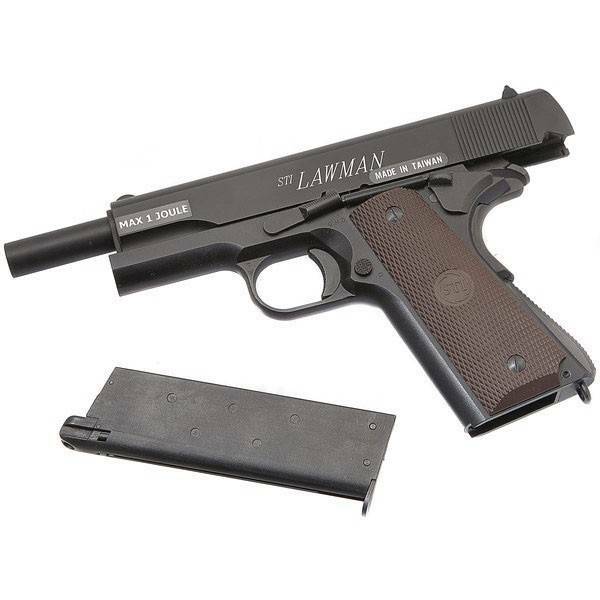 Complete with the official licensing by STI and trademarks to mirror its popular Lawman series pistols, this gas blowback pistol is a perfect sidearm for all airsoft enthusiasts! The frame and slide are constructed out of metal, and the pistol grip is solid metal with polymer-textured panels for a non-slip grip. 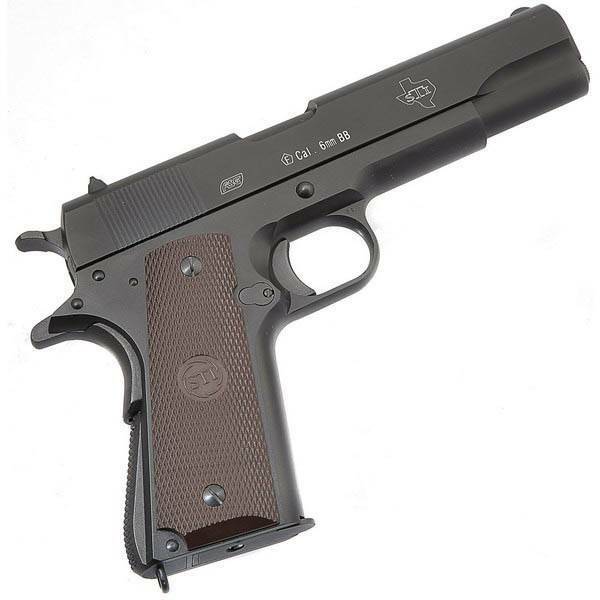 This 1911 airsoft pistol features a single-stacked magazine that lets you fire up to 14 rounds of semi-automatic fire! It delivers incredibly hard kick and is perfect for any player looking for realism and authenticity packed into one. Just by handling the pistol you can tell that it is a high quality piece as the fit and finish is top notch. Racking the slide feels incredibly smooth which also helps the guns impressive cycle rate. The trigger is better than a real steel Kimber 1911 and feels more like you are pressing a button than pulling trigger. Also featured is a functional grip and thumb safety. The level of detail is also very high with engraved texturing on the trigger, magazine release, thumb safety, hammer and main spring housing. With a high efficiency gas delivery system this gun is not a gas guzzler so you will get the most out of every ounce of gas. Squeeze the trigger on this sucker and the lightweight aluminum slide rockets back with a menacing kick that only a KWA can deliver. Its velocity is as expected around 320 FPS, that combined with the adjustable Hop Up system delivers quite long hits. With a weight of 765 gramms, it's not the heaviest but certainly not the lightest 1911 on the market. Originally designed in 1911 by John M. Browning, the M1911 can be seen in various forms in almost every major war since World War I to the Vietnam War and is still used in various other combat theaters today. It remained as the U.S. standard sidearm up until the early 1990's when it was replaced by the smaller caliber M9 pistol. However it is still favored by some over the M9 due to its massive stopping power from its .45 caliber design.